Exploring an aggregate approach to EM debt as volatility continues. The emerging markets sell-off has continued in recent weeks, as the U.S. dollar remains strong amid domestic economic data that supports a case for higher U.S. interest rates. 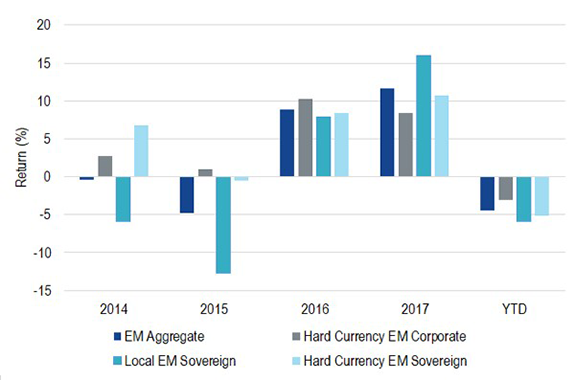 Many emerging markets local currencies have been severely impacted, particularly those of more vulnerable countries and where political risk is rising. While we believe that value can now be found in various aspects of the emerging markets debt universe and that the local currency space may become the most attractive opportunity of all, the spike in volatility may prevent certain investors from adding to or initiating allocations. For these investors, we believe that a blended approach combining emerging markets sovereign and corporate bonds across hard and local currencies may present an attractive alternative. Although an all hard currency allocation can mean avoiding local exposure altogether, hard currency sovereign debt has performed similarly to local sovereign bonds year-to-date. Allocating to the entire investable opportunity set means approximately 64% exposure to hard currency and 36% exposure to local currency bonds. This diversification may potentially help reduce the volatility and drawdowns associated with local currencies, while offering exposure to their higher potential yields, lower historical correlation to the interest rates of developed markets, and the potential to benefit from currency appreciation. Further, the performance of emerging markets corporate bonds and sovereign bonds can vary greatly in a given year, in part due to a diverse geographic makeup and a broad sector mix that can respond differently to various macroeconomic environments. Source: MVIS. Data as of June 28, 2018. Past performance is no guarantee of future results. Index returns are not representative of fund returns. For fund returns current to the most recent month-end visit vaneck.com. See definitions and descriptions below. We believe that a passive blended strategy warrants attention, given the index’s track record relative to actively managed peers, as well as the low cost and transparent nature of index-based strategies. Although diversification and tradability are fundamental to virtually any passive strategy, we believe these elements should be given particular emphasis when investing in emerging markets debt due to the potential concentration risk of many active strategies and the importance of maintaining liquidity and low transaction costs, particularly in stressed market environments. EMFX is an abbreviation representing emerging markets currencies. 1Based on MVIS EM Aggregate Bond Index, MVIS EM Sovereign Bond Index (Local FX), MVIS EM Sovereign Bond Index (USD & EUR) and MVIS EM Corporate Bond Index (USD & EUR), which represent aggregate emerging markets bond exposure, local currency emerging markets bond exposure, hard currency emerging market sovereign bond exposure and hard currency emerging market corporate bond exposure, respectively. EM Aggregrate is represented by MVIS EM Aggregate Bond Index, which is the exclusive property of MV Index Solutions GmbH (a wholly owned subsidiary of Van Eck Associates Corporation), which has contracted with Solactive AG to maintain and calculate the Index. Solactive AG uses its best efforts to ensure that the Index is calculated correctly. Irrespective of its obligations towards MV Index Solutions GmbH, Solactive AG has no obligation to point out errors in the Index to third parties. The VanEck Vectors® Emerging Markets Aggregate Bond ETF (EMAG®) is not sponsored, endorsed, sold or promoted by MV Index Solutions GmbH, and MV Index Solutions GmbH makes no representation regarding the advisability of investing in the Fund. Hard Currency EM Corporate is represented by MVIS EM Corporate Bond Index (USD & EUR), which tracks the performance of Emerging Markets corporate bonds denominated in USD or EUR. Local EM Sovereign is represented by MVIS EM Sovereign Bond Index (Local FX), which tracks the performance of emerging markets sovereign bonds denominated in local currency. Hard Currency EM Sovereign is represented by MVIS EM Sovereign Bond Index (USD & EUR), which tracks the performance of emerging markets sovereign bonds denominated in USD or EUR. Indices are unmanaged and are not securities in which an investment can be made. Index performance does not represent fund performance. An investment in EMAG may be subject to risks which include, among others, credit risk, call risk, interest rate risk, and sovereign and quasi-sovereign defaults, all of which may adversely affect the Fund. High yield bonds may be subject to greater risk of loss of income and principal and are likely to be more sensitive to adverse economic changes than higher rated securities. International investing involves additional risks which include greater market volatility, the availability of less reliable financial information, higher transactional and custody costs, taxation by foreign governments, decreased market liquidity and political instability. Changes in currency exchange rates may negatively impact the Fund's return. Investments in emerging markets securities are subject to elevated risks which include, among others, expropriation, confiscatory taxation, issues with repatriation of investment income, limitations of foreign ownership, political instability, armed conflict and social instability. The Fund's assets may be concentrated in a particular sector or region and may be subject to more risk than investments in a diverse group of sectors or regions. The information herein represents the opinion of the author(s), but not necessarily those of VanEck, and these opinions may change at any time and from time to time. Non-VanEck proprietary information contained herein has been obtained from sources believed to be reliable, but not guaranteed. Not intended to be a forecast of future events, a guarantee of future results or investment advice. Historical performance is not indicative of future results. Current data may differ from data quoted. Any graphs shown herein are for illustrative purposes only. This content is published in the United States for residents of specified countries. Investors are subject to securities and tax regulations within their applicable jurisdictions that are not addressed in this content. Nothing in this content should be considered a solicitation to buy or an offer to sell shares of any investment in any jurisdiction where the offer or solicitation would be unlawful under the securities laws of such jurisdiction, nor is it intended as investment, tax, financial, or legal advice. Investors should seek such professional advice for their particular situation and jurisdiction. Please note that Van Eck Associates Corporation serves as investment advisor to investment products that invest in the asset class(es) included in this commentary. Diversification does not assure a profit or protect against a loss. Debt securities carry interest rate and credit risk. Interest rate risk refers to the risk that bond prices generally fall as interest rates rise and vice versa. Credit risk is the risk of loss on an investment due to the deterioration of an issuer's financial health. Securities may be subject to call risk, which may result in having to reinvest the proceeds at lower interest rates, resulting in a decline in income. International investing involves additional risks which include greater market volatility, the availability of less reliable financial information, higher transactional and custody costs, taxation by foreign governments, decreased market liquidity and political instability. Changes in currency exchange rates may negatively impact a fund's return. Investments in emerging markets securities are subject to elevated risks which include, among others, expropriation, confiscatory taxation, issues with repatriation of investment income, limitations of foreign ownership, political instability, armed conflict and social instability. Investing involves risk, including possible loss of principal. Bonds and bond funds will decrease in value as interest rates rise. An investor should consider investment objectives, risks, charges and expenses of any investment strategy carefully before investing. No part of this material may be reproduced in any form, or referred to in any other publication, without express written permission of Van Eck Securities Corporation.